The application process for Workers' Compensation can be difficult to understand. Workers' Compensation insurance is not a federal program, but a program that is managed by each individual state through private insurance carriers. Therefore, each state has a separate application process. It is important that you follow the procedure as it is outlined by your state. Most states recommend that an injured worker hire an attorney to file a Workers' Compensation insurance claim. Nonetheless, when filing a Workers' Compensation insurance claim, there are a few initial steps that you can take to assure the best possible outcome for your claim. When injured on the job, immediately seek professional first aid and report the injury to your employer. Immediately seek medical treatment and evaluation from ONE doctor. Always tell the truth regarding the severity and extent of your injury. Insurance carriers and state Workers' Compensation boards take fraudulent claims very seriously and routinely prosecute such claims to the fullest extent of the law. Keep a record of all relevant employer information such as your direct superior, the name and address of your company, and other relevant information regarding the status of your employment with the company. Be sure to learn the name of your employer's Workers' Compensation insurance carrier, the address and contact person at the insurance company, and if possible your case or claim number. Keep receipts for all medical treatments, medications, related travel expenses, and all other costs related to your injury. If your claim is approved these costs will be reimbursed to you by the insurance carrier. Follow your doctor's recommendations precisely and attend each required doctor's visit. 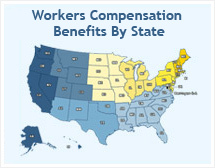 Each state has a Workers' Compensation review board. This board serves different roles depending upon the state. Usually, the board reviews Workers' Compensation claims and/or mediates disputes between private Workers' Compensation insurance coverage providers, employers, and injured claimants. If you have questions about how to file a successful workers' compensation claim, would like filing assistance or your claim has been denied by an insurance carrier (also referred to as "controverted") click here for a free evaluation of your case by a legal professional.